Digging Into "A Borrowing of Bones"
More than crime fiction brought the Miss Demeanors together. 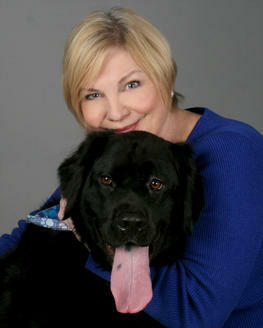 We all also happen to be clients of the fabulous literary agent, Paula Munier. 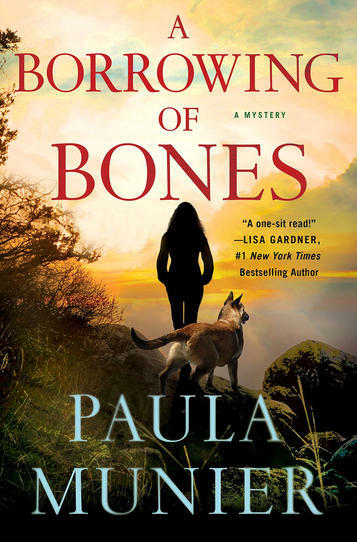 Paula’s debut mystery, A Borrowing of Bones, came out yesterday! Publisher’s Weekly says, “The portrayal of working dogs will appeal to fans of David Rosenfelt and Margaret Mizushima. The blend of lovingly detailed setting and lively characters, both human and canine, makes this a series to watch.” Friend of the Miss Demeanors and #1 NY Times bestselling author, Lisa Gardner, adds, “Finally, a suspense novel that combines my two loves: a thrilling police procedural, assisted by two fabulous working dogs. A one-sit read that will make you happy you did.” Robin: Your day job is a literary agent. How common is it for agents to write in the genre they represent? Paula: Lots of agents write. Evan Marshall writes writing books and mystery novels, Donald Maass writes novels and nonfiction. Edwin Hill, whose debut Little Comfort just came out, works for Macmillan. Jill Santopolo is an acquisitions editor who also writes bestselling novels for both children and adults. The list goes on and on. Robin: You previously wrote a non-fiction book about a dog (Fixing Freddie) and, now, a dog is featured prominently in your debut mystery. As a lifelong dog-lover myself, I have my own thoughts about this, but what do you think makes our 4-legged friends such compelling characters and so much fun to write? Paula: My dogs and cats have been a big part of my life since I was a little girl. They’ve always been my friends—sometimes my only friends when I was an Army brat moving from school to school with no siblings and no friends in the new neighborhood yet. My pets filled the void. I think that people like to read about the real world, and pets are part of our real world. Certainly, I was inspired by the real-life hero working dogs I met through Mission K9 Rescue and other organizations. To write about dogs who are literally saving our lives, both in civilian and military life, is a huge honor and privilege. Dogs help people with disabilities, they sniff out bombs and drugs, they rescue the lost and the injured, and more. Dogs can do all kinds of amazing things. I like writing about dogs, and I like reading about dogs—and I admire the writers who do it well. As an agent, I look for such writers, because there’s usually a market for their stories. In fact, I always tell aspiring writers that if they can write from the point of view of a dog or a cat and pull it off, I’ll sign them tomorrow. I personally don’t dare to try that. But look at how successful the writers are who can, such as Spencer Quinn in his popular Chet and Bernie series or Garth Stein in his bestseller The Art of Racing in the Rain. That makes for great storytelling. Robin: A Borrowing of Bones is the first book of a series. Did knowing that you’re creating a cast intended to span multiple books impact your process? Paula: Whenever you write a mystery series, you have to populate that first book with people who can provide a supporting cast for your protagonist. I knew I needed that supporting cast, and I wrote many of the supporting characters right into the story in the first draft—but my editor wanted more and so I gave him more. If you go back and study the first novels in series that you love—which is what I did when I realized I was going to write a series—you’ll see the seeds of subsequent books right there in the debuts. I reread Lee Child’s first Jack Reacher novel and Louise Penny’s first Inspector Gamache novel and Elly Griffiths’s first Ruth Galloway novel and Julia Spencer-Fleming’s first Clare Fergusson novel and that proved enormously educational for me. Robin: How did your role as a teacher in the Writer’s Digest First Ten Pages Boot Camp inform your experience as an author? Paula: Ironically, I never set out to write A Borrowing of Bones as a novel. What I set out to do was come up with a sample opening chapter that I could use in The Writer’s Guide to Beginnings to show how you need to revise a story and polish a story before you try to shop it. Because most of us editors and agents don’t give you much past that first page—it’s either there on that first page or not. What we’re looking for is that feeling you get when you open a new book from your favorite author. You’re in your favorite chair, you’ve got your glass of wine or your cup of tea, and you turn to that first page and you read the first couple lines and you just go, “Ahhhhhhh,” because you know you’re in good hands. You know you’re in for a good ride. It’s right there on the first page. That’s what we’re looking for. We’re looking for that feeling, and I was trying to teach writers how to evoke that feeling in The Writer’s Guide to Beginnings. I had just been to this fundraiser for Mission K9 Rescue, an organization that devotes itself to rescuing and finding forever homes for abandoned military working dogs. The Army takes care of its dogs, most of the time anyway, but the dogs provided by defense contractors often end up with very uncertain futures. The fab thriller writer Leo Maloney hosted this fundraiser where we got to meet the dog handlers and their working dogs, be they cops and drug- sniffing dogs or soldiers and bomb-sniffing dogs or game wardens and search-and-rescue dogs. I fell in love with these dogs and their handlers. I needed that first chapter, and I couldn’t use anybody else’s first chapter because I was going to use it as an exercise and revise it and revise it over the course of the book. So, I wrote a sample chapter inspired by these dogs and their handlers. My agent Gina Panettieri read it and loved it and said, “You should finish this book.” Ultimately, I have Gina and Phil Sexton of Writer’s Digest to thank for A Borrowing of Bones. Phil came to me and said, “We’d like you to write a book based on your First Ten Pages Boot Camp.” That book became The Writer’s Guide to Beginnings, and the opening chapter that I wrote to use as a sample became A Borrowing of Bones. Robin: As a non-fiction author of a series of acclaimed books on the craft of writing, how is this debut – a work of fiction – different for you? Paula: This book is different for me because all my life I wanted to be a mystery writer. It was not a desire that I necessarily articulated until later in my life, but I always thought that if I ever had the time, I’d want to write the kind of mystery I love to read. For me to do this now is a dream come true. It’s been on my secret writer’s bucket list for a very, very long time. It just goes to show that it’s never too late. I had given up on this dream and I thought, “Well, you’re never going to have time or the energy or the effort or the wherewithal to ever do this, and that’s okay.” Then I wrote that first chapter—and because it was just an exercise for a writing book, I wrote it just for fun. I threw in everything I loved—Vermont and Shakespeare and vets and working dogs and the woods—I even threw in Pablo Neruda. (The title comes from a line from a Pablo Neruda poem.) Let that be a lesson to all of you writers out there: It’s never too late. Just do it. Robin: Find Paula’s debut, A Borrowing of Bones, at your local bookstore or favorite online bookseller!